It's funny how even a mini vacation leaves you with lots of things to take care of once you get back... Yesterday was filled with laundry, putting things away, grocery shopping, sorting mail - all the fun stuff. Questions: Do you take your own food and/or snacks on vacation? What's your favorite food item to take on vacation? Funny, I've been craving sushi, too! Sounds like a great time with great food!! We always pack food for vacation at the shore - lots of fruits and veggies and we mainly take sammies/wraps for our lunches at the beach. You're right, it does feel so good to eat well on vacation - I hate that sluggy feeling when I'm not eating healthy foods! I always "forget" about all the work that has to be done after we get back from any sort of weekend away. Takes me forever to recover! We definitely take food with us on vacation. I almost always make hummus! It's easy to eat with crackers and cut up veggies (that are also easy to pack) and it's a source of protein, fiber, doesn't spill (easily) and can be prepared so many different ways. Yes, I definitely take my own food... just because I am so picky. I love taking rice cakes, fruit, yogurt, carrots, and crystal light. I usually pack a cooler if it is a long trip. Great job on eating healthy and exercising while on vacation. Most people can't say they did this and use it as an excuse to eat more and be lazy! I sadly SADLY haven't BEEN on a vaca for too many years, HOWEVER I am positive at least I would sneak in my magic bullet so I could still make green smoothies and keep at least that going. it's a hurdle for the future for sure! oooh that sushi looks YUM! We started taking our own food with us at Thanksgiving last year and I LOVE IT! I made a meal plan (snacks included) and packed everything all weighed out and ready to go in packets. For 'weekend trips' like to the lake - I make all of the meals (including sandwiches, snacks, etc.) and we just heat and eat and feel great. (who wants to eat a bunch of random meat in a loft with 10 couples... um, not me). With 7 kids, and maintaining a large weight loss for a long time, I definitely take food with us! It's better for us economically, and for our health! 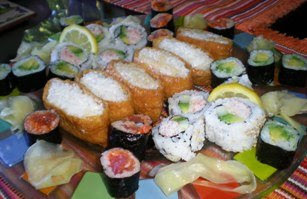 I still can't sushi, but I like to see the pictures!